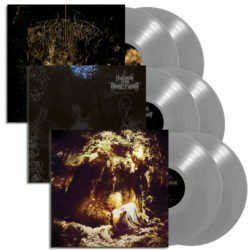 Coinciding with Southern Lord’s 20th anniversary this year, the label announces the reissues of all three of the label’s acclaimed albums from WOLVES IN THE THRONE ROOM; Two Hunters, Black Cascade, and Celestial Lineage. Each special reissue will be issued on limited edition silver vinyl. Southern Lord and WOLVES IN THE THRONE ROOM‘s USA and European Webstores will have black vinyl available near mid-September. The band will also be offering autographed editions and limited bundles from their store. Check WITTR.com for details. Anderson continues, “It is our mission to create a sanctuary for bands/artists/musicians to have their creative works released exactly as their vision was intended.” These three reissues will be no exception. Southern Lord and WOLVES IN THE THRONE ROOM‘s US and European webstores will have black vinyl available near mid-September. For Southern Lord press inquiries in The Americas contact dave@earsplitcompound.com and otherwise contact lauren@rarelyunable.com.